I love Providence. I think it's a great city. 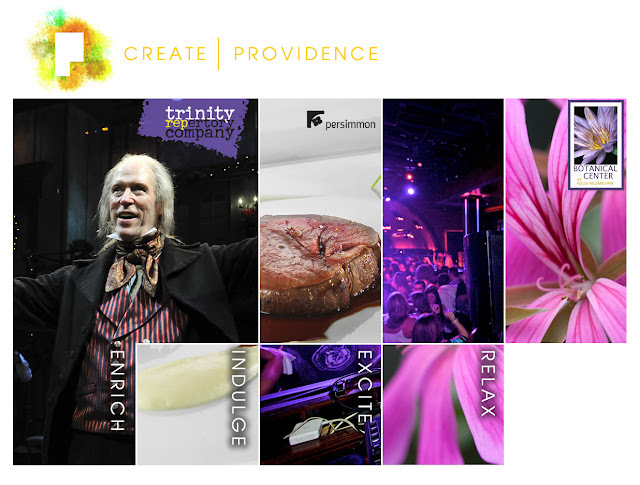 The marketing, advertising, and branding for Providence, on the other hand, are awful. Their current "P" logo and simple box design on the website are very capable, but tearfully basic and boring. With a down economy, Rhode Island's economy even more down, and a desperate need to energize economic activity, the city needs new marketing materials. So here we go. Philadelphia has a strong brand around the word “Philly,” so they obviously have no interest in the letter. The two Portlands, Maine & Oregon, do not have any interest in the “P”, with the only problem being the Portland Art Museum. Its bold, container-logo “P” branding is similar to what I may want, but luckily it is an art museum, and Providence is a city. That gives me some wiggle room. There are smaller cities out there, like Plano and Peoria, but Providence has some advantages. Perhaps because it is situated between New York and Boston, it punches far above its weight as regards food, entertainment, and business. It also has no small degree of fame. People know about Providence. Importantly, it makes sense that Providence would have a brand. It is a capital city. People are accustomed to capitals having a brand. It would be weird if Sheboygen suddenly had a top-flight branding from Moving Brands, but not Providence. All things considered, I feel safe working on a “P” logo. Next, I move on to rendering some of the ideas in vectors. Just to get a look at them. Here, I'm able to make a number of decisions. The flat “P” made out of blocks, the one in the lower right near the two fancy designs, was my first idea, and I really liked it initially. When I put it down, though, its complexity became a big issue. The sketch you see was one of over two dozen, and none of them managed to overcome the inherent complexity of its concept. I tried to make the "P" look like a sidewalk, like the sides of buildings, like plain geometric shapes — everything came out cluttered and complex. For a logo, and truly for an entire brand, that is unacceptable. While tangential elements can be subtle and complex, the core must be bold and impressive. I thought about using icons of the Providence skyline. For example, the three smoke stacks come from the Point Street power station. When entering the city from the South, they dominate the skyline in a way that none of the default high-rise buildings do. They, too, flopped when actually rendered. The image is way to conservative, way too rigid, and just way to freaking boring. When compared to the other ideas on the page, it cannot compete. I pick out the ones with which I have no immediate problems and begin the process of winnowing out the crap. As I stumble through the brain barf that I have produced, I begin to get a better idea of what I want to communicate with the identity. I love Providence. I think it has some actually unique elements to it. Many cities advertise themselves as unique, when in fact they are near-as-dammit identical to any other city of a comparable size. While Providence isn't exactly sui generes like New York or Paris, very few, if any, cities of its small size have half of what Providence has. That is a real asset that can be advertised. In service of this, I need certain things to be communicated. I want a sense of professionalism, business, structure (this is a city afterall, and not a children's play center), but also artistry and playfulness. This is a city in which to work and live. So what elements of culture can we draw upon? The first thing that comes to mind is that Providence has a number of schools, notably Brown and RISD, and it makes sense to maybe hint at these in the brand. Brown is Ivy League — always good — but is a bit too straight-laced and snooty. RISD is a much better candidate for inspiration. Every city wants to argue that it is packed with culture and art, but few cities have world class art schools in them. As such, I am immediately attracted to the P inset into paint strokes. It's playful, but not cartoonish. It implies serious art. I like the contrast between the rigid “P” shape and the organic paint. This gives the logo both a professional and an artistic appearance, while also just being interesting to look at. This is a solid logo idea. 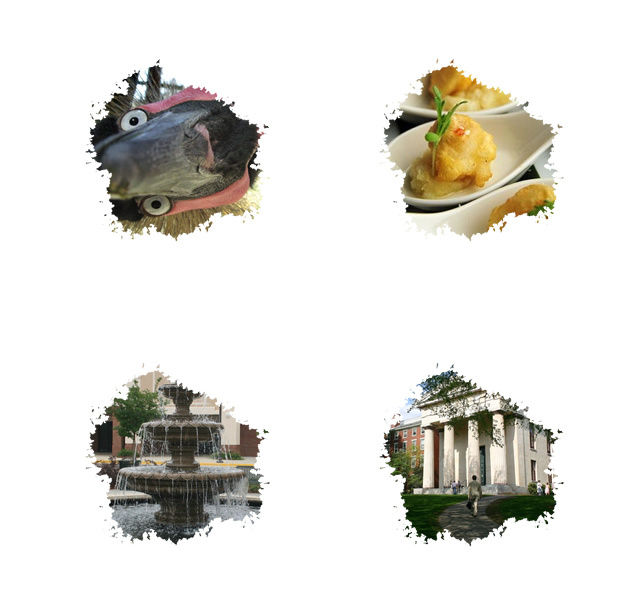 Providence is loaded to the hilt with restaurants. Every cuisine imaginable is available. Italian, Ethiopian, French, Pakistani: it's a wonderland of flavors. With that in mind, I created the swirl design. I like it, but I am less attracted to it because of its complexity. It won't show as well at smaller prints and resolutions. I also don't think that it is bold enough. 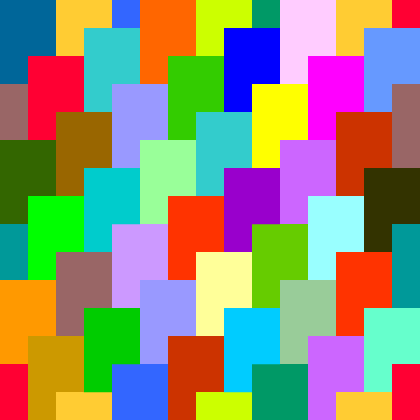 It's so complex it actually loses some identifiability. Still, I'm nothing if not adventurous, so I shall make a prototype anyhow. It actually comes out looking alright. It holds up much better than I thought it would at low resolutions. It begins to look like a video game character when it gets down to favicon-level resolutions, but not bad. I still don't like it though. First, the explosion of colors and shapes reduces the uniqueness of any given element of the design. It doesn't have instantly recognizable gross elements to it and becomes more of a jumble. That's what we want in a good brand a logo: bold identifiability. Also, it looks like a fish making a fart noise with its lips. The dual-circle P is good. It's curvy and friendly, but it looks a bit too much like a product brand — perhaps a pharmaceutical company. It's good, just not for this application. I love the word mark that breaks up “Providence RI.” It's quirky and unique, and also forces people to analyze the logo for a second to figure out what's happening. Most of the time, that's bad. But sometimes, sometimes, it can be used to good effect to make something that would be boring, not boring. The P with the wave running up and down the stem is good, and fits in with the Ocean State, but I'm wary of that relationship. Providence is not Rhode Island and vice versa. Providence needs to have its own identity, so while the wave is a nice touch, I think that it should be avoided. The six squares represent the side of a building. It's very rigid, very urban, perhaps a bit old-fashioned, and totally not right for Providence. I want art! Culture! Energy! This looks like the logo to a high-rise condo complex with a target demographic of oily bachelors who prefer everything to be dark wood and leather. The P flipbook fits my needs. It is playful, bold, and professional-looking. It implies construction paper or something similar. It also provides immediate inspiration for an animated logo where scenes of providence flip by on pages before coalescing into the "P" logo. Sadly for this poor little logo, it is here where similarities between other brands becomes a problem. I earlier mentioned the Portland Art Museum, and its “P” looks very similar to this “P”. They used their “P” as a container logo, with images of the art in the museum contained within the logo, which is likely how I would have gone with this “P”, meaning that it is, unfortunately, out of consideration. So, after the great culling, we are left with the broken “PROVIDENCERI” and the paint “P”. I like both of them a lot and am obviously inclined to trying to make them work together. On first inspection, everything looks decent. Not the best match yet, but the playful breaking of the PROVIDENCERI lettering matches well with the playful color splotch. Now with all of my critical eye focused on my painted "P", I'm noticing that I don't love the strokes behind the letter. And that's fine! From the very beginning, I knew that the background was going to change. "knock-out" or "negative space" logos, as they're sometimes called, almost beg for it. The more variety that can be injected into a brand, the better. It gives it a sense of life that allows the brand to stand on its own, separate in many ways from the thing that it is representing. 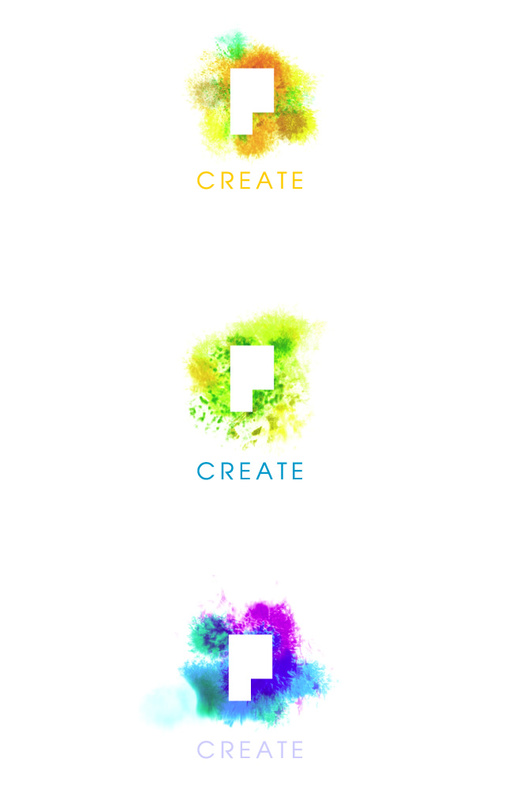 The logo is supposed to try to capture the energy and variety of Providence, so the image must have energy and variety. 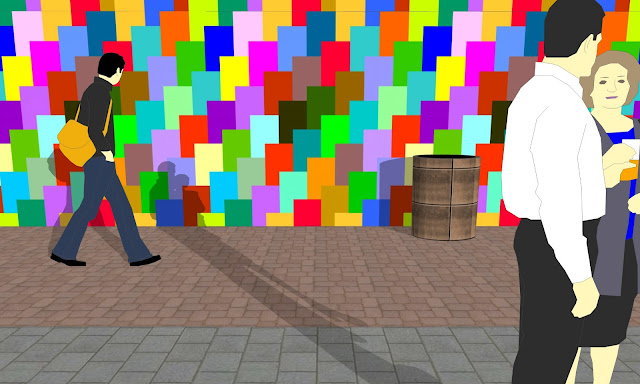 Paint is all well and good, and it captures the artistic spirit of the city, but how else can we apply this idea? The first thing that comes to mind is the food reference that we abandoned earlier. I want to bring it back since Providence's dining scene is truly impressive. Again, it's not New York, but for a city with a population under 200,000, it's mind-blowing. We have the opportunity to create color schemes for different times, such as the seasons. I love making a dynamic brand that can change with the weather, so whenever a work gives me the opportunity to do that, I jump on it. 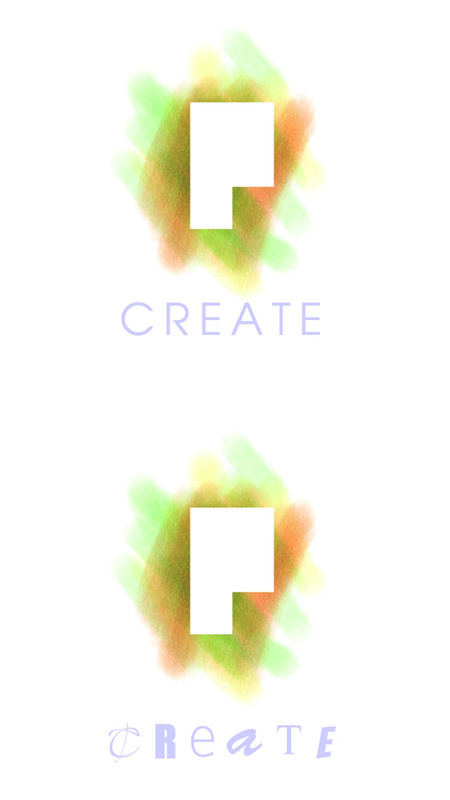 Likewise, we can use the “P” as a container shape to include images. This moves closer to the Portland Art Museum branding, but our "P" is sufficiently different where it's not an issue. The paint splat can also act as a container. When this is used, it must be combined with the broader brand so a connection is made. Separate, it is merely an image inside a splat. It's here where the brand reveals itself. It may not have been specifically intended in earlier work, but it's obvious by now that the real heart of the brand is the "P" mark. Used as a knock-out logo or a container logo gives the brand extreme flexibility. 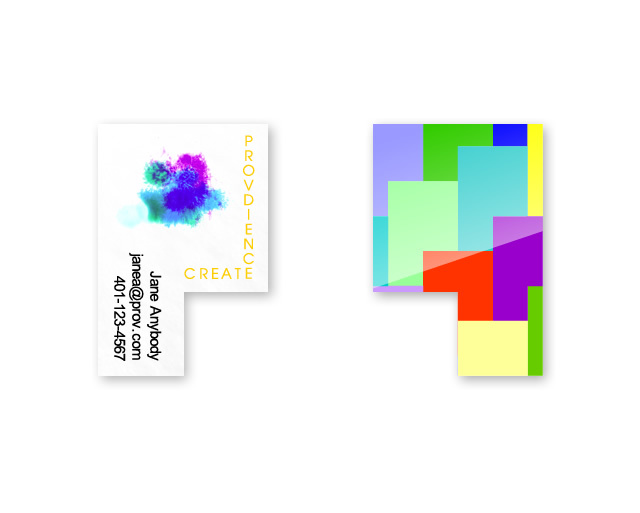 We can use different colors, textures, images, anything behind that identifiable “P”. It is quite powerful. While I generally avoid using color in branding efforts, especially the logo, since it is best to have an identity be as simple as possible, there are certain situations where color can be used safely. Since this is a branding effort for a city and not a product, the logo is going to mostly appear in glossy fliers and pamphlets, web pages, mailings, and tourist information. All of this is not only going to be full color, but be really full color. At no point will the logo need to be flat, tiny, and printed on the back of a bottle. That said, a logo that degrades well is always better than a logo that doesn't degrade well. While degradation of the image into something unrecognizable isn't a deal-breaker for me, I would like to ensure that many avenues of application are as open as possible. It works great. This is one of the reasons why brands should always be bold and simple in their basic idea: even if your application is complex, you can strip things away and not lose the brand's essence. The "P" looks fantastic in both greyscale and flat black, and it is obvious what they are. The flat black could, I guess, be seen as blood or poo or something like that, but I'm not going to try to accommodate the bizarre inferences that weirdos will make. The logo stays as-is. The second test is much more important. Since this brand will be heavily used in online and digital display applications, it must look good at low resolution. I call this the favicon resolution because favicons are the smallest resolution that a brand must fit in to. Every instance of the brand fits perfectly in the tiny size. The wordmark is even still legible! This is a success no matter how you look at it. Next, we move on to the slogan. The current slogan is “The Creative Capital.” This isn't as bad as “A Most Livable City,” but it's not far off. Again, a brand must be impactual2 but also not presumptuous. Calling a city that is really quite small the creative “capital” is just arrogant. It's also bland. This is something that every city could call itself. Providence needs something that other cities couldn't necessarily claim. For this reason, it's better to avoid complete statements. A good brand captures ideas and emotions, not fully cogent linguistic nuggets. By that I mean avoid sentences. Being complete, sentences also limit the brand. Language is built off of context. The more context you provide, the less flexibility there is in interpreting words. As such, “The Creative Capital” says both too much and not enough. Just imagine if Apple had created the "We're Different From Microsoft and IBM" ad campaign instead of the "Think Different" ad campaign. Nebulous words and standalone words are the best slogans and make for the best brands. I have a strong minimalist bent running through my design. Not the trendy minimalist crap that you see everywhere on Tumblr, but minimalist in the belief that the best design removes everything that it can. As such, slogans with fewer words are always better than slogans with more words, especially when what the slogans communicate is similar. So while “Live Creatively” is slightly different from “Create,” I think that “Create” is better. It implies art, but it also implies construction, building, planning, the future, invention — all positive things. I had two ideas for the lettering. First, a straight-laced, rigid and modern text, the second a playful take. I prefer the more rigid version for a few reasons. First, that sort of lettering was very popular throughout the 80's and early 90's (anyone remember Whatchamacallit ads? ), and since we're not going for a retro look, we want to avoid similarities with past aesthetics. While that wild lettering breaks down the identifiability in the same way as the complex fish “P” logo discussed earlier, the real meat of this is not the image, but the word, so it's not that big of a problem. My primary reason for preferring the rigid version is that since a city needs to communicate many things, we want a rigid structure to the brand. We don't want every element of it to be artsy and playful. We want playfulness to be slotted into a very well-defined part of the overall brand and to not have it leak out into other parts. That role is being played by the background and to a lesser degree the broken “PROVIDENCERI” word mark. If we add more playful parts to the brand, and not wanting a brand that is defined by playfulness, we run the risk of masking or muting the impact of the elements of that brand that are playful. Strong contrast between brand elements helps them stand out. As such, it is best to leave the other elements of the brand as rigid and professional. The brand and logo are flexible, so now we can be creative with their implementation. There is sometimes a risk of overdoing it with a good brand. You want to stamp it on everything. As I was playing around with website designs, I realized that the rigid design of the "P" actually lent itself to becoming a functional part of the site. I'm dancing a bit close to the edge when it comes to overdoing the brand design, but I'm not over the edge just yet. As long as I restrict the branding to just this intro menu, it will be fine. This is only the top of the home page — above the fold. Below the fold, which starts just below this image, is a concise menu system. From a usability standpoint, it's always best to give users precisely what they want as quickly as you can. That's why Google's home page is nothing more than a search box. This limits a designer's ability to really wow a user. In this regard at least, we can define good design when it requires user interaction as skilfully taking away immediate information in favor of things to wow or impress the user. This is why the "wow" element must be clean, impactual, and uncluttered. It needs to be quickly processed and moved out of the way so the user can return to getting the information that they want. You'll notice how there's no menu system up top. No need yet. Just clean white with the logo. We may want to use the upper right for important announcements in the future, but for the sake of this branding, it stays white. The logo lends itself to being made into a pattern which can then be applied to things. Colors make everything more colorful. By this point in the development, it is becoming apparent to me that there is a problem. I had, at the beginning, two ideas that I liked: the paint splat and the broken wordmark. I combined them and they worked out pretty well, but as I've gone on, my implementation of the wordmark has become almost non-existent. This is because the two elements are incompatible. What pushed me over the edge was the wordmark in the lower-right of the prototype web page. It absolutely doesn't belong. It is entirely outside of the aesthetic of the rest of the brand. The clean, modern typeface chosen for the slogan doesn't combine well with the squared wordmark, and it is obvious that that clean, modern typeface works best with the logo. What I have to accept is that the paint splat and the word mark are not complimentary elements of a single brand. They are, in fact, two, separate brands that I am trying to glue together. I need to get rid of one, and since the paint splat brand is the more flexible, the wordmark gets tossed. This fixes some issues, namely allowing me to use the word "providence" in conjunction with the splat logo, whereas the word was previously "owned" by the wordmark. This also frees up some space, since I don't need to shoehorn in the wordmark into places where it doesn't naturally fit. Eliminating the wordmark, while a difficult choice because I liked it a lot, has improved the brand. It also allows me to extend the slogan in a BIG way: a fill-in-the-blank slogan. 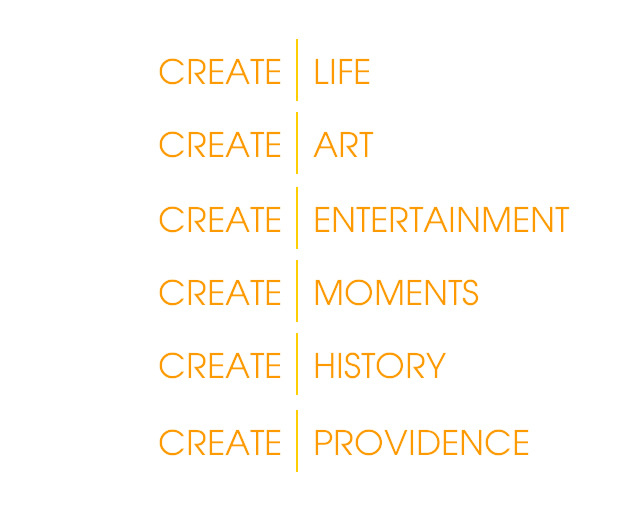 Instead of "PROVIDENCE | CREATE", I'm going to put the main word in front of "Providence," allowing us to guide extensions to the slogan. The final construct, CREATE | PROVIDENCE, directly states the most important part of the slogan that we want to communicate: by simply being in Providence, a person is helping to create Providence. It is a city both separate from, and part of, the people living in it. The more people we have, and the more stuff they are doing, makes Providence all the better. A prototype brochure with intro paragraphs aimed at tourists. The body of the text is as follows. Please excuse the slight repetitiveness of it. It's what would be called a draft. Providence is a unique city. Sure, it may not be as large as New York, or as elegant as Paris, but that isn’t what makes us special. What makes us special is how completely unexpected it all is. We have restaurants that rival cities ten times our size. We have a thriving artistic community, a robust gay community, and a immense system of intellectually stimulating resources undergirded by three world-class universities. Our small size utterly belies our vibrancy. We are a city of life. We are a city of fire and fury. We are a city in a state of perpetual creation and recreation. That is what we mean by our motto: create. We are creating great things. We are creating a great life. Importantly, we are giving you, our visitor, the tools to create your own experience here. When you visit here, you leave behind a piece of yourself like ripples in a pond. Your acts, your creation, continues to echo in our city long after you are gone. We appreciate your presence because whenever you come here, you help make us better, and that makes us bigger, better, and more vibrant for your next visit. When you help to create Providence, you help us, and you help yourself. From the depths of our hearts, thank you for visiting. Thank you for making Providence what it is: a city beyond borders; a city beyond time; a city that does not exist in any given state, but instead exists as it will become. A city forever in the future. A city forever being reborn. A city forever being created. The "Create" slogan encourages creative interaction between the customer (citizens and tourists) and the product (the city). This is critical because a good brand is only as good as the entity that it represents. Brand insofar as it is an abstract association between a person and a thing is created during interactions, so the truly difficult part is nurturing that interaction when the vast majority of it takes place between people and the disparate elements within the city. Thus, the more interaction, the better. This gets to the ultimate point that I wanted to make and it's one I hammer home with any branding: a brand is only as good as the product. Yes, a brand can be better than the product for awhile. Hitting the airways hard with a large marketing campaign, packaging the product in flashy designs, engendering good feelings: all of these things can help butter over a sub-par product, but it is ultimately smoke and mirrors. It is an illusion that cannot help but fade. Providence cannot simply brand itself and then hope that the constituents of the city will make a good product. The city must become intimately involved with the creation and maintenance of that product. The best way to do this is to have a robust set of experiences that people can have within a city. Don't just provide categories. Provide actual itineraries for visitors and citizens — provide structure. Recommend restaurants, link to review websites, have citizens be able to post on the brand pages with minimal meddling by site moderators. Governmental branding initiatives try to avoid this because it means that their focus must be on one business over another. That's very heartbreaking and all, but it also doesn't matter one bit. If providing a good product means that some businesses will receive some attention while others will not, that's the way this must go. Simply providing a list of businesses to visitors and citizens doesn't do anything. That is why no one ever goes to city websites and instead goes to Yelp! and Citysearch. The city must provide things. Bring the various elements of the city under the new branding. Run special promotions and events. Engage the people! It's not simply enough to have some website where an intern posts about what's happening in the city. People don't care about that. Even if they subscribe to your Twitter, they are ignoring it. Give them a reason to pay attention. Provide coupons, deals, packages, and passes to events managed by the city. Don't just rely on the businesses and groups within the city to provide an infrastructure of stuff. The city must be its own mini-Groupon, Ticketmaster, event planner, and promoter. The city must be far more engaged in its own impression and construction than is currently the case. I'm talking hundreds of thousands of dollars, if not millions, invested in community gardens, free computer labs, community food projects that engage people to cook and eat, and targeted events for specific interest groups. Host inter-faith nights, Dungeons & Dragons nights, ice skating competitions, and graffiti challenges. Engage local businesses to donate prizes in exchange for co-branding. Major events should be taking place under the Providence brand every week. Many of these things can be done cheaply and engage huge numbers of people. The events must be free. Other elements of the event can be monetized, be it food carts, souvenirs or experiences, but the initial thing must be free. It's the only way to get people out the door. To see how the city is currently failing in this regard, if we go to the current Go Providence website and look up a list of things to do, it is very long. But if we look up the list of free things, it has fewer than ten items. Every year in Rhode Island, attendance at the beaches reaches record levels. As the economic downturn has remained steadfast, people are increasingly going to the beach because it is one of the few things that can be done cheaply. This isn't necessarily a moral issue, although I think that that argument can be made. It is a societal issue, though. It is a problem for all aspects of society and this is undeniable. It increases crime, reduces economic activity, reduces the value of the city's brand, and makes it difficult for any municipal effort to increase public perception of, and interest in, the city. It is imperative that the city provide a large selection of free things. The more that the city provides, the better the experience. The better the experience, the better the public perception of the brand. The better the public perception, the better the city as an entity unto itself becomes. The better the city becomes as an entity, the more people will seek out the city as opposed to other cities and experiences. This causes a feedback loop of good things, driving population growth, economic activity, and prosperity. In short, the city's motto becomes more than just a branding exercise; it becomes an honest representation of the city's values and character. 1: Yes, I understand that this is because Pittsburgh has been rated the most “livable city” in the U.S by The Economist, but that's nothing to brag about. It ranks 29th globally. Worse still, a person with knowledge of this ranking coming to the branding will think that Pittsburgh is essentially saying “Yeah, we're alright.” Worse STILL, that's only one ranking system, and it is heavily biased toward English-speaking cities. Other ranking systems, such as the Mercer Quality of Life Index, put Pittsburgh 50th out of 50. 2: I'm aware that this isn't technically a word, but I'm using it anyhow, dammit.